The scope of the Akademik Gıda is to offer scientists, researchers, and other food professionals the opportunity to share knowledge of scientific advancements through a respected peer-reviewed publication. The Academic Food Journal serves as a forum for important research and developments in food science and technology. 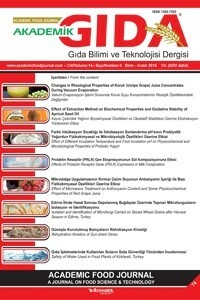 The journal is currently covered by CAB Abstracts, Index Copernicus, EBSCO, Food Science and Technology Abstracts (FSTA), Eurasian Scientific Journal Index, TÜBİTAK-ULAKBİM Life Sciences Database.